High quality metal film resistor, with 1% tolerance. The WM series Metal Film Resistors are manufactured using the latest Magnetron Vacuum Sputtering System. This ensures a very stable resistive medium having a very low temperature coefficient. 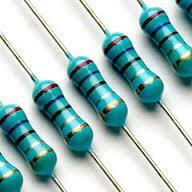 The resistors are insulated with layers of light blue lacquer.